Juice extraction with two speeds – low for softer produce like berries to prevent over-pulverizing and high for harder produce like rind-on pineapple. Reduce prep time with a wide-mouth feed chute that offers less pre-cutting – even with whole apples! A powerful stainless steel cutting blade system powers through the toughest produce, while a dual safety interlock system offers added peace of mind. Easy-to-assemble dishwasher-safe parts make setup and cleanup are a snap! MSRP $99 Based on the Manufacturer's Suggested Retail Price, this juicer is less expensive than average and is priced in the bottom 29% of juicers. 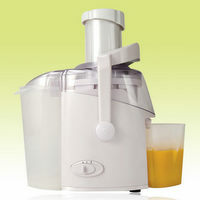 Star Rating 4.2 User reviews, ratings, and feedback indicates that this juicer is rated about average by 42 users when compared to other juicers.